Neighbourhood design hotel. 28 handcrafted guest rooms and suites. Welcome to the real Bangkok. Volve Hotel – to travel is to evolve. A hotel name which reflects the evolution of modern day explorers. Guests staying with us are given a warm welcome and not just treated as tourists or travellers, but as true explorers. Volve Hotel is about bringing the excitement of exploration back. Be immersed in and inspired by the story and not just stay for shelter. A new side of the city is awaiting to be discovered. Welcome to the real Bangkok. Inspired by heritage homes of the Sukhumvit area, the hotel’s interior design tells the story of the evolution of the local neighbourhood through unique design details and quirky reinterpretation of traditional materials and objects. Located just 3 minutes’ walk from the BTS Thong Lo skytrain station on a quiet residential street in the heart of Thonglor+, the cosmopolitan and cultural melting pot comprising some of the best bars and restaurants in the city. At just 28 guestrooms and suites, the hotel’s lobby is a drawing room, café and executive club floor combined. A comfortable gathering place for experienced explorers of the world, the young and young at heart travellers who look at the world with a sense of free-spirited adventure – whether for leisure or business alike. 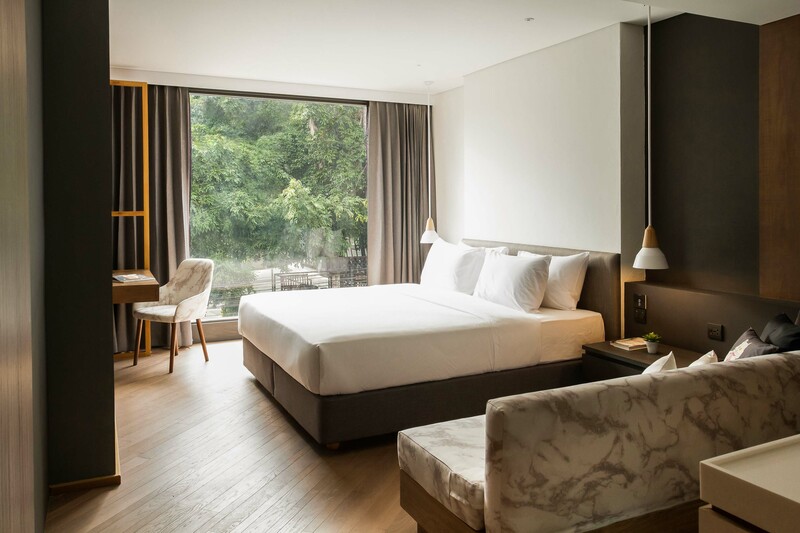 Explore Bangkok from one of our Deluxe Rooms, outfitted with all the comforts of home. A great room for couples, groups of friends or solo travellers. Upgrade to the Deluxe Corner for more space to unwind and relax. Equipped with our signature King bed, marble print sofa and enough space to plan out your next adventure. The Studio Suites, with their stunning garden views, are the pinnacle of Volve’s overnight experience. Suitable for both leisure and business travellers, the suite is fitted with a large work table and living area to plan the days’ strategy of exploration. The Two Bedroom Suite is perfect for families or groups of friends. Two bedrooms, two separate bathrooms, a bathtub, a dedicated living room and enough space for all to enjoy the wonders of Bangkok.